Copper,silver, polymer clay, paper, found objects. Signed and dated by artists. Copper,silver, polymer clay, paper, found objects, leaf segment of a brass drawer pull, Signed, dated, and numbered by artists. 2’ X 2 3/4” X 3/4"
Ojimeand agate. Silver and brass frame. Leather cord. Ojimeand agate. Silver and brass frame. Leather cord. There is some wear to the leather cord. Bone, silver, bronze. Leather cord. Signed, dated, and numbered by artists. “The rich social import of Scott’s work is matched by its visual richness. Scott describes her beadwork as a cross between sculpture and painting. The artist treats the beads like the dabs of paint in a Pointillist canvas, but unlike paint (a medium Scott has tried), glass beads have the advantage of being translucent and can both capture and reflect light. Scott’s virtuoso weaving technique – a method similar to crochet called the peyote stitch, which she learned from a Cree Indian – allows great fluidity of form, resulting in protruding hollow forms and undulating effects. 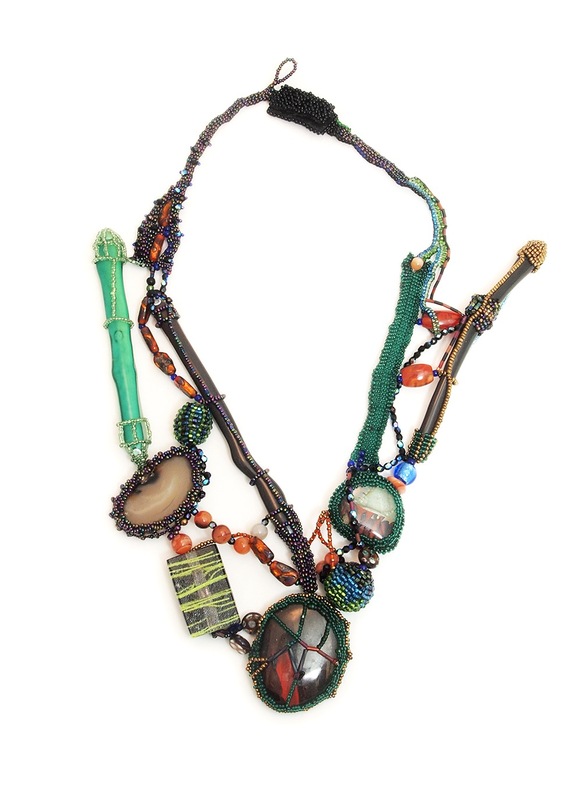 Scott is always seeking greater technical challenges; her work has grown increasingly more daring and dazzling in its visual richness and range of subject matter.” – Susan Grant Lewin, One of a Kind: American Art Jewelry Today. Renowned as the “Queen of Beadwork,” Joyce J. Scott’s exuberant beaded sculptural forms and neckpieces are provocative and confrontational, addressing contentious political and social issues such as gender, race, and class struggle. Born and raised in Baltimore, Joyce is a descendant of African-Americans, Native Americans, and Scots. Three generations of storytellers, quilters, basket makers, and wood, metal, and clay workers inspire her artwork. "Julie Mihalisin first began working with glass and precious metal as a graduate student at London's Royal College of Art. She quickly developed a fascination with the contrasting properties of glass and metal. The artist experimented with the technique of "kiln-slumped glass jewelry," in which a metal framework that helps shape the glass is in turn entrapped in the glass." Provenance: Made in the artists studio in Virginia. "Robin Kranitzky and Kim Overstreet run a company called Lost and Found. They design wearable art using found objects. The two became friends while working at a Richmond, Virginia, department store, and their shared interest in collecting led them to create jewelry together based on their “finds.” Their brooches are collage-like dioramas that often incorporate their fascinations with fairy tales, science fiction, surrealism, and theater." Provenance: Made in the artists studio in Virginia. Exhibited at SOFA. Chicago, Illinois October 20 - 23, 1994. "Robin Kranitzky and Kim Overstreet run a company called Lost and Found. 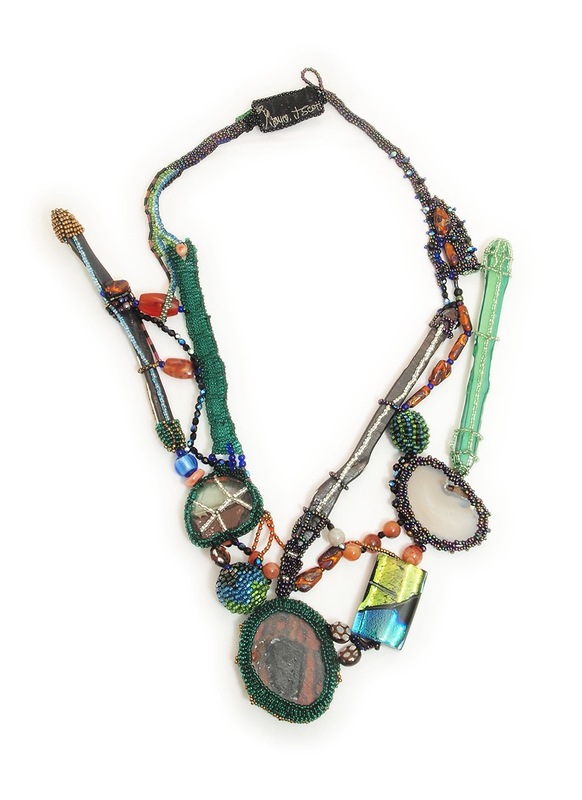 They design wearable art using found objects. The two became friends while working at a Richmond, Virginia, department store, and their shared interest in collecting led them to create jewelry together based on their “finds.” Their brooches are collage-like dioramas that often incorporate their fascinations with fairy tales, science fiction, surrealism, and theater." "Ramona Solberg is considered a pioneer of the studio jewelry movement, often called " the Grandmother of Northwest Found-Art Jewelry". She generously shared her time and knowledge teaching at the University of Washington and Central Washington University). A generation of jewelry artists including Laurie Hall, Ron Ho and Kiff Slemmons were mentored and inspired by Ramona. After World War She studied jewelry on the GI Bill after World War II (during which she served in the U.S. and for three years after the war in Germany as an information and education sergeant). Ramona was an adventurous and intrepid traveler to all corners of the world and a collector of all sorts of wondrous and strange bits and pieces and fragments of this and that, which she incorporated into her work. Ramona was a firm believer that if it isn’t fun, then why do it? This was her personal and her professional mantra. Feathers, beads, toy parts, shells, buttons, coins, pieces of bone (anything and everything she collected) were stored in jars in her studios in Seattle and Ellensburg, Washington. It was like walking into a sorcerer’s workshop with magical elements everywhere you turned.From this treasure trove Ramona drew upon her Norwegian heritage to bring order to what could have been chaos. All of her jewelry is laid out and engineered to design perfection. Suddenly objects found on a beach have relevance and symmetry when placed next to a bottle cap or a domino or a discarded piano key because of their precise arrangement." "Ramona Solberg was one of the first jewelers to break away from making traditional decorative ornaments and to bring intensely personal statements into jewelry design. Her pieces which reflect basically symbolic forms, appeal to those who regard their personal adornments as talismans of our time." Ramona Solberg (1921 – 2005) liked a fast-paced mystery novel, a good martini, the company of friends and the riches of the world’s diverse material cultures. When she died in 2005 at the age of 84, she had achieved wide notoriety for her jewellery’s innovative designs and her influence as a teacher, had received the National Metalsmiths Hall of Fame Award, and had been profiled as a “Living Treasure” in the documentary, Ramona Solberg: Jeweler, Teacher, Traveler. She was also honored as a fellow of The American Crafts Council. Ms. Solberg eschewed precious materials and made necklaces and pins out of found objects from cultures around the world — bottle tops, dice, sardine cans, dominos, beads, bone , tea whisks, beetle boxes, Polish amber, Persian petrified coal (jet), game boards and coins. The Sand Point apartment where she lived alone was jammed with boxes and drawers of such items, many of which she collected during her extensive travels. The resulting pieces were large and substantial,in her words, "meant to be worn rather than displayed in cases." As Professor of art in the Fine Arts 3D Department at Massachusetts College of Art and Design,he has been teaching jewelry, metalsmithing, digital techniques for object-makers (CAD) and other classes since 1985. He has taught summer workshops and has been part of several conference events at Haystack Mountain School of Crafts. He has also taught workshops at The Royal College of Art in London, Silpakorn University in Bangkok Thailand, and Penland School of Crafts. At MassArt, Wood organized five international symposia, organized and curated “In Situ”, an exhibition of contemporary metals artists at MassArt. 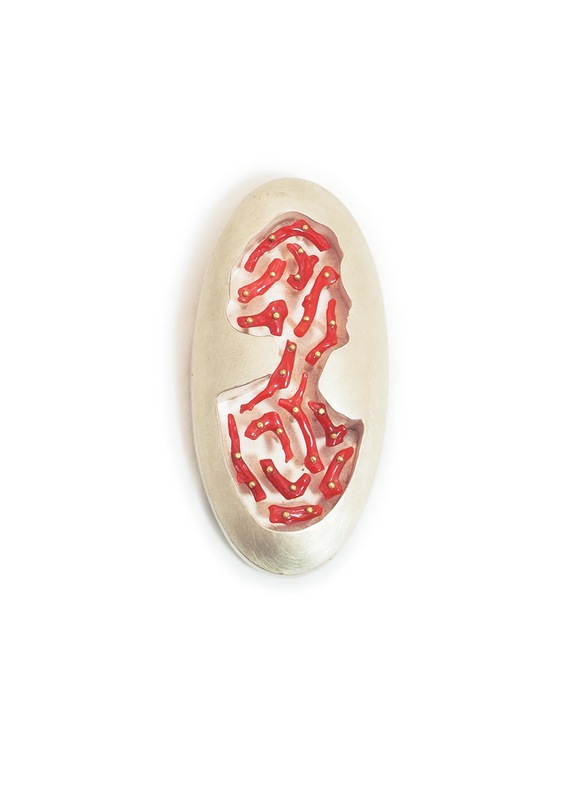 Exhibitions of his work include one-person shows at Mobilia Gallery in Cambridge MA; group exhibitions include Schmuck 2001, Munich Germany; Signals: Late 20th Century American Jewelry, Cranbrook Museum of Art. Work is in the public collections of the Renwick Gallery of the Smithsonian Institution, Racine Art Museum, Racine WI, and the Museum of Fine Arts, Boston, MA.